Would you describe yourself as creative? Sometimes we can feel hesitant to use the term, perhaps because of it's associations with traditional art and more tangible or active creative pastimes. But the language we use about ourselves is so important - a careless self critical remark about how un-creative we are can build an unintentional block that stops us from ever trying to use creativity as a form of expression. While creativity is of course present in the more obvious ways - a painting, a song, a novel - it can also be found in plenty, more hidden places. 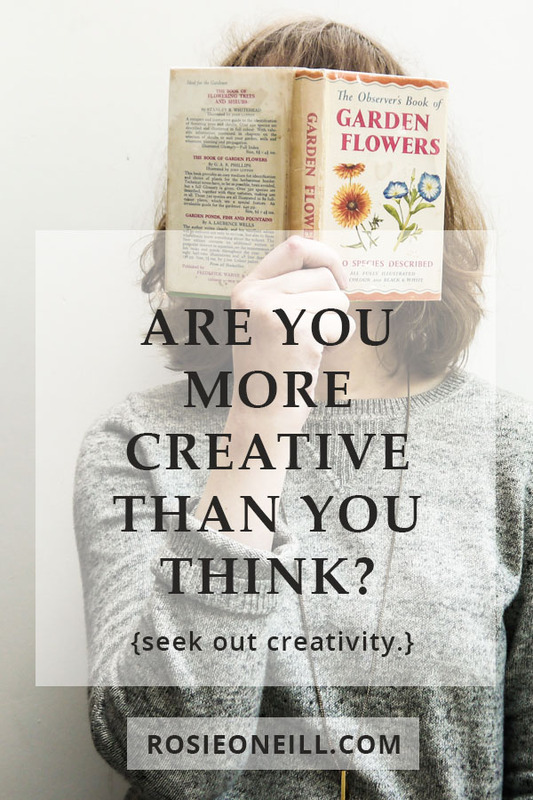 You might think that you've never been any good at painting, or that your writing is terrible - but that doesn't mean you're not creative. Maybe it's a case of simply not having found the right craft, you might be perfectly wonderful at crochet, or origami or calligraphy. Or maybe you haven't given yourself enough of a chance to get good. All skills take practise, and creative skills are no exception - the trick here is to enjoy the process so much that you don't mind being in that awkward, still-learning phase. Your creativity might prefer to show up in other places. The words you write for your blog, your instagram captions - are all creativity at work. The photographs you carefully compose and edit to share in little squares on social media - this is creative. More than anything, creativity at it's most stripped back can be found in the way you see the world around you, your mindset, the ideas you take with you on your day and the ways you solve problems with solutions. Now - would you describe yourself as creative? Throughout December I'll be sending a special weekly email series to all my Studio Notes subscribers - simple, thoughtful tips to help you connect a little with your creativity in a gentle, positive way. It's a busy time of year for lots of us, and we can sometimes forget that a quiet moment nurturing our souls is so worth the time. If you'd like to be involved, you can sign up below.